Andrew Friedman gets a champagne bath after the NL West clinch Tuesday. This afternoon to reporters, Don Mattingly disclosed some of the Dodgers’ pitching plans for the final five games of the regular season. Thursday starter Brett Anderson might have a scheduled shortened start, and the same goes for Clayton Kershaw on Monday. By all appearances the Dodgers’ National League Division Series Game 1 starter on October 9, Kershaw will be on four days’ rest when the playoffs begin, so the Dodgers don’t need to skip him entirely. But it’s not like he’s going to be going the distance or anything, even if it means the difference between getting 300 strikeouts for the year or not. Clayton Kershaw against the Giants in September: Two starts, 18 innings, one run, seven singles, no extra-base hits, two walks, 28 strikeouts, and one hellacious at-bat against Madison Bumgarner. 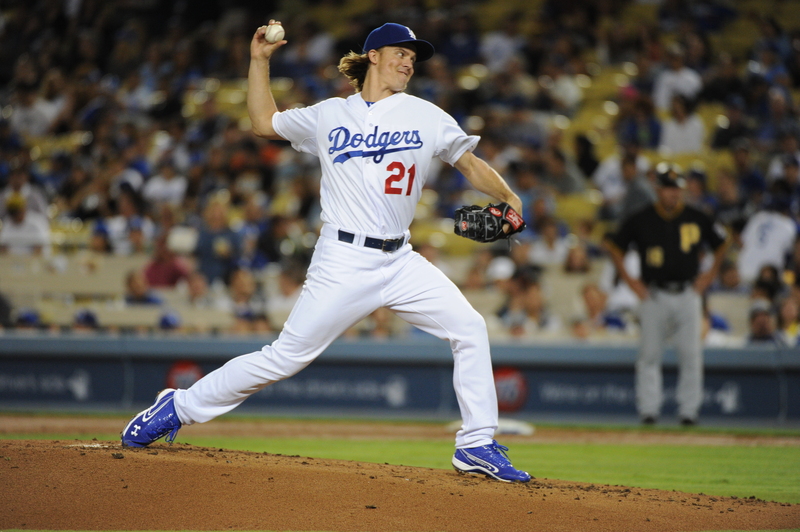 In 227 1/3 career innings against the Giants, Kershaw has 243 strikeouts with a 1.54 ERA, the fourth-lowest career ERA against a single opponent in MLB history, and a 0.82 WHIP, the lowest against a single opponent ever. Congratulations to Zack Greinke, who today was named the winner of the 10th annual Roy Campanella Award, given to the Dodger player who best exemplifies the Hall of Famer’s spirit and leadership. Campanella’s daughter, Joni Campanella Roan, will present the award during pregame ceremonies Sunday. Previous winners are Rafael Furcal (2006), Russell Martin (2007), James Loney (2008), Juan Pierre (2009), Jamey Carroll (2010), Matt Kemp (2011), A.J. Ellis (2012) and Clayton Kershaw (2013 and 2014). Nice gestures by the Giants on their scoreboard and social media after Tuesday’s clincher by the Dodgers, and it’s appreciated — and we return the feeling. When the Dodgers last landed in New York City, the Mets were a contender, but also a bit of a laughing stock. 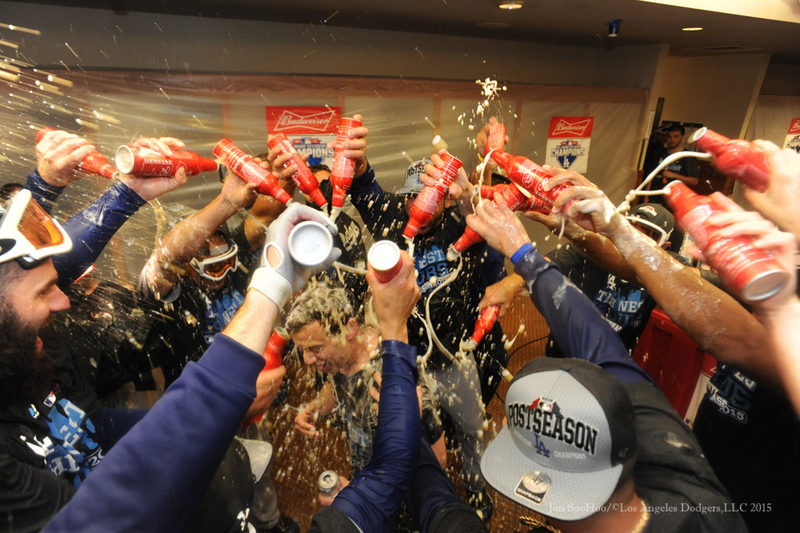 For more images from Tuesday’s clinch and celebration, visit LA Photog Blog. Now that the Dodgers have won the National League West earned their spot in the National League Division Series, naturally we wonder who those 25 Dodgers in the next round will be. Here’s my look, and I’m speaking for myself here, not the organization. In what has perhaps seemed like an up-and-down season, Los Angeles truly ruled the National League West, leading nearly every day from April to tonight’s title-clinching, 8-0 victory. 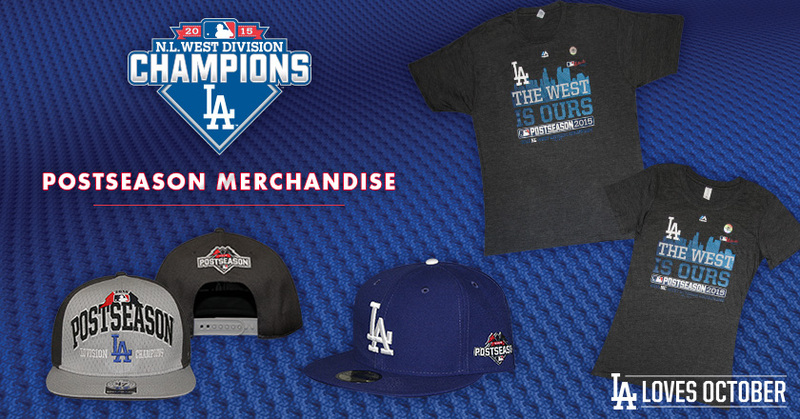 Get your hands on Dodger postseason gear at the Top of the Park store from 9 a.m. to 5 p.m. Wednesday and Thursday, and from 9 a.m. until postgame during the Dodgers’ final homestand Friday through Sunday. Tickets for the Dodgers’ first two potential National League Division Series home games are sold out, but for more information on other potential playoff games, visit dodgers.com/postseason. 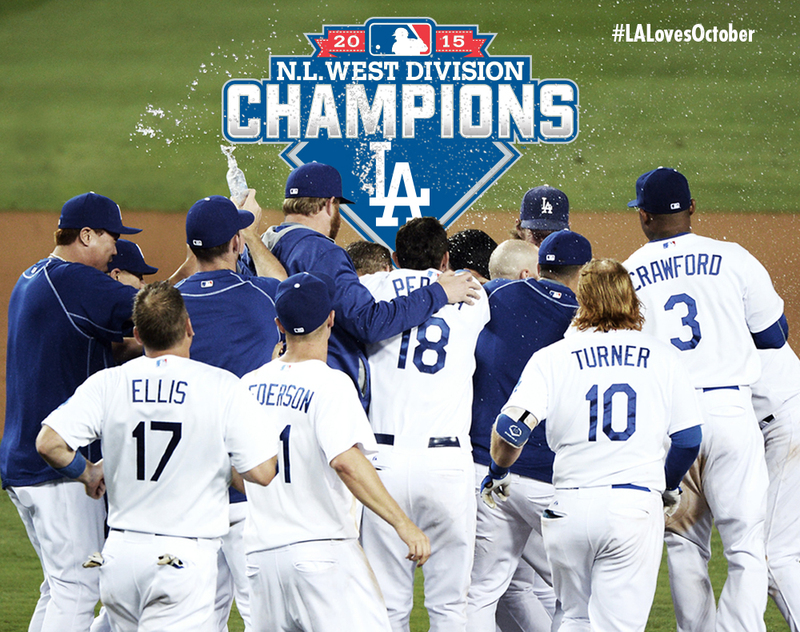 Laying down the Kershaw, Dodgers win NL West! The Titanic skipped the iceberg. The boys beat the breaks. All the numbers are magic tonight. 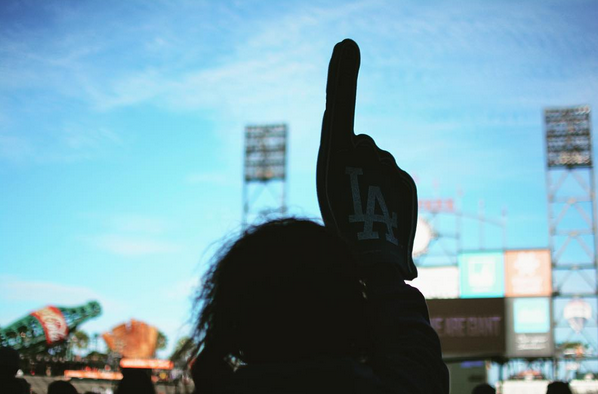 For the first time in their history, the Dodgers are going to the postseason for the third consecutive year. Soaring on home runs by Kiké Hernandez, Justin Ruggiano and A.J. 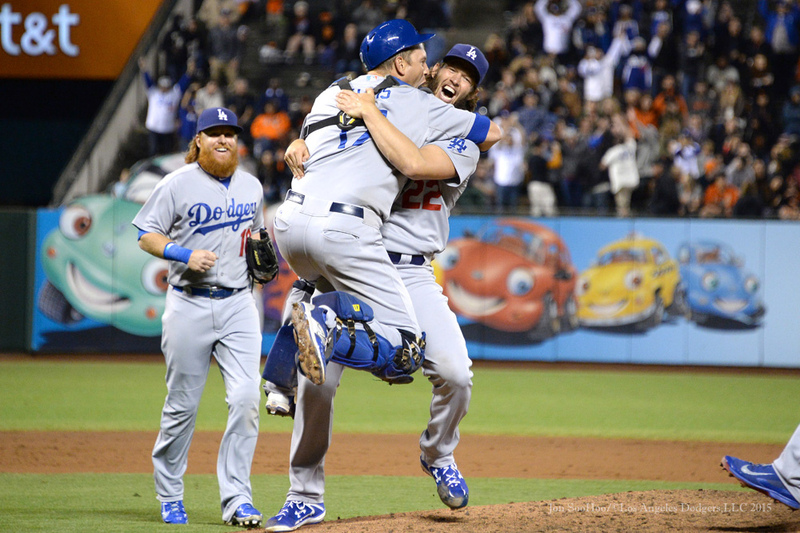 Ellis off 2014 World Series hero Madison Bumgarner, sailing on the Unsinkable Clayton Kershaw, the Dodgers stood up and shook up San Francisco, 8-0, to win the 2015 National League West title. For Kershaw, it was his first career one-hitter (Kevin Frandsen’s clean single in the second inning preventing next-level history) and the second consecutive year he pitched the Dodgers to the NL West title — an eight-run victory both times. For Ellis, it was the second time in three years he homered in a division-clinching game. Next challenge: To end the 26-year drought without a World Series title, the Dodgers’ longest since they won their first World Series in 1955. 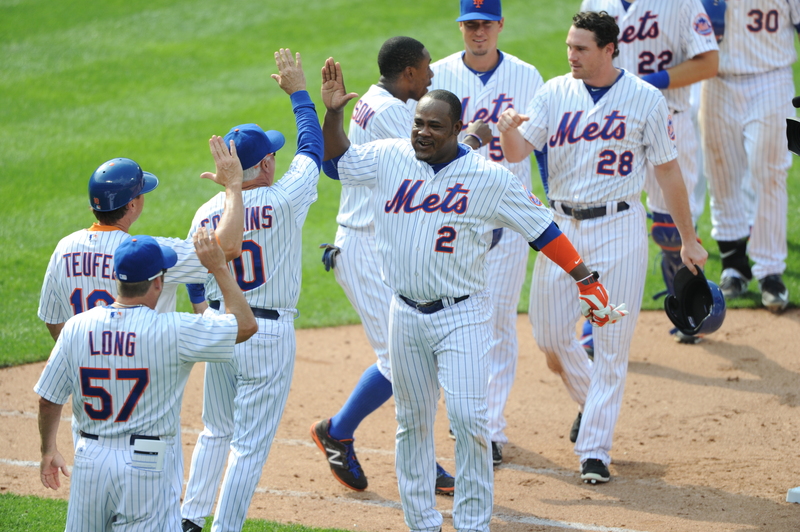 They will face the New York Mets in the National League Division Series, beginning October 9. With the Dodgers having lost eight times in their last 10 games, stuck for 100 hours in a row on a magic number of two to clinch the division, Kershaw rose to the occasion for, as if it were even possible, one of the most brilliant games of his brilliant career. He retired the final 19 batters, struck out 13 in all (two shy of his career high), while needing only 104 pitches for the 12th shutout of his career. Kershaw has 294 strikeouts in 2015, putting him within striking distance of 300 for the year, though he will probably have an abbreviated start in the Dodgers’ regular-season finale Sunday. Either way, Kershaw has the most whiffs for an MLB pitcher since Curt Schilling and Randy Johnson topped the 300 mark in 2002. In his first start since returning from the disabled list, Hernandez provided the initial spark — or sparks. He led off the game with a single off Bumgarner, went to third on an omenic Kelby Tomlinson error, then scored on Justin Turner’s sacrifice fly — all before hitting the first Dodger homer to begin the third. Though Kershaw was dealing, allowing his only single and walk in the third inning, it was a plenty tight game into the fifth, when whatever leverage Bumgarner was hanging onto seemed to give way when it took him 13 pitches to retire Kershaw — the longest at-bat by a big-league pitcher this year. The Dodgers didn’t score, but Bumgarner finished the fifth inning already at 100 pitches. With two out in the sixth, Bumgarner hung a curveball that Ruggiano blasted for a 3-0 Dodger lead. Ellis went back-to-back to make it 4-0. In the eighth, the Dodgers broke it open with four runs, the big blow a team-leading sixth triple of the year by Andre Ethier. 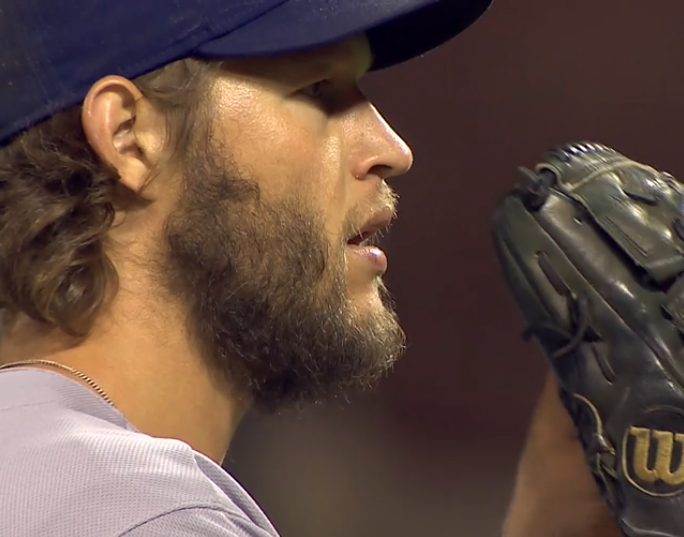 Starting with the last out of the third inning, Kershaw retired 16 batters in a row, striking out 10 of them, to reach the ninth on 96 pitches. Trevor Brown whiffed on three pitches. Angel Pagan flied to left on two pitches. Kelby Tomlinson took tow balls, then hit a slow chopper to shortstop, where Corey Seager flung to Adrian Gonzalez to ignite the celebration. When the torch passes, it can burn. 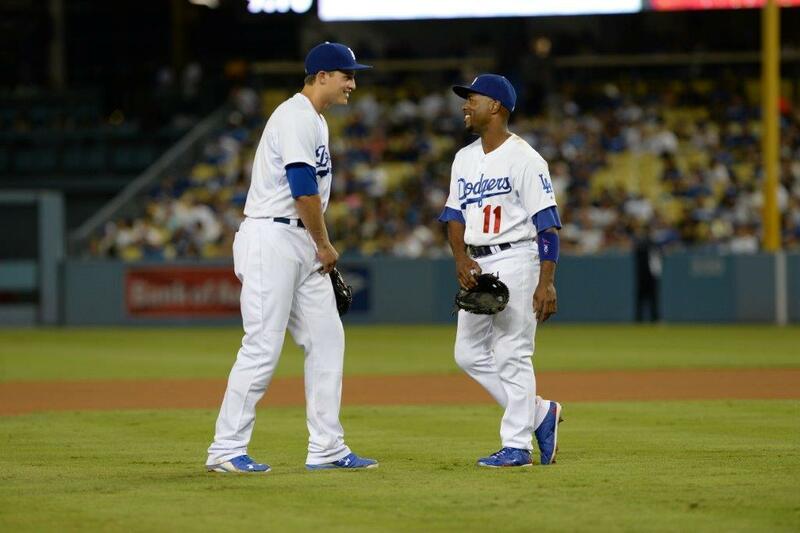 But the Dodgers are hoping when it goes from Jimmy Rollins to Corey Seager, it is warm and fuzzy — and winning. Reports from Don Mattingly’s pregame session with reporters today indicated that Seager has become the Dodgers’ starting shortstop, seizing his September callup when Rollins was injured and supplanting the veteran. In what has become an undoubtedly weird September for the Dodgers, this might be the weirdest fact of all. 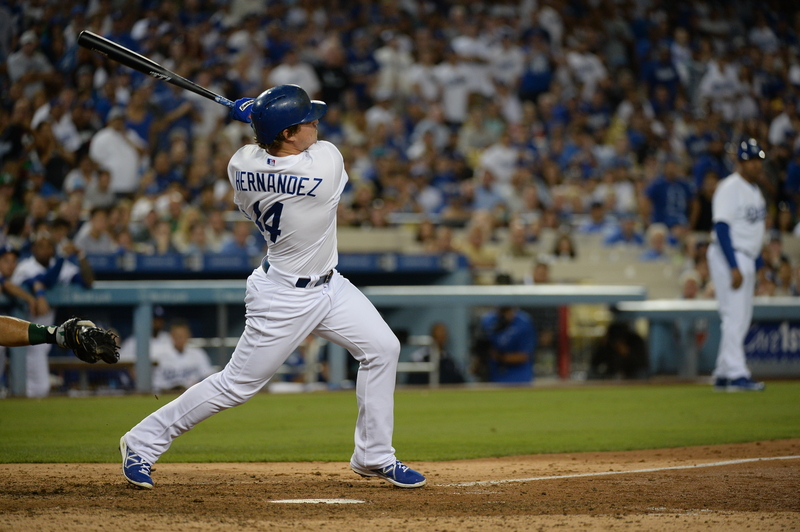 The Dodgers have as many sacrifice bunts from cleanup hitters this month as home runs. Justin Turner’s ninth-inning bunt Monday, which did lead to the tying run before the 3-2, extra-inning loss, was the first sacrifice by a Dodger No. 4 hitter in nine years and the second of the 21st century. 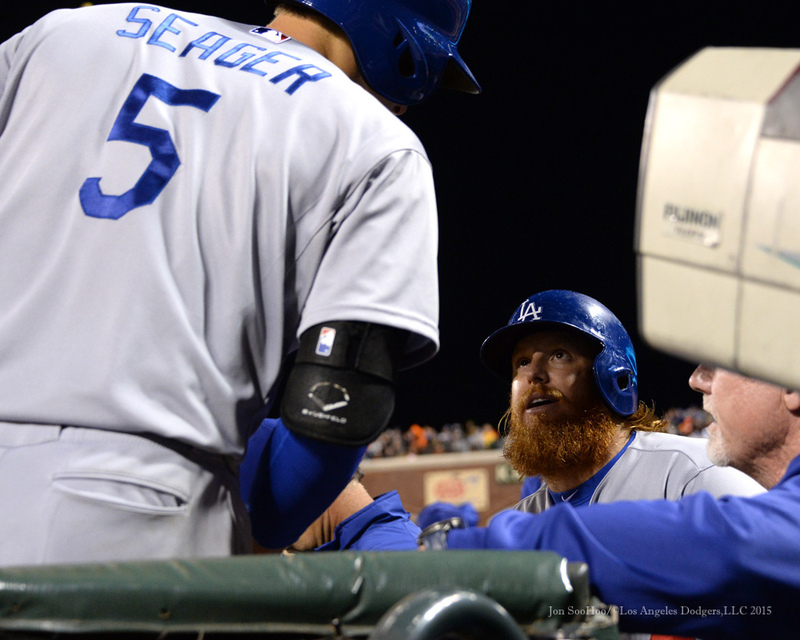 Once upon a time, sacrifices by Dodger cleanup hitters weren’t rare. Go back long enough, and you’ll find 78 games in which Zack Wheat bunted a runner over while batting fourth. But it was prevalent among the Boys of Summer (Jackie Robinson — 48 games), the Go-Go Dodgers of the ’60s and even more recent years. Steve Garvey bunted from the cleanup spot 16 times. Heck, even Pedro Guerrero did it thrice. 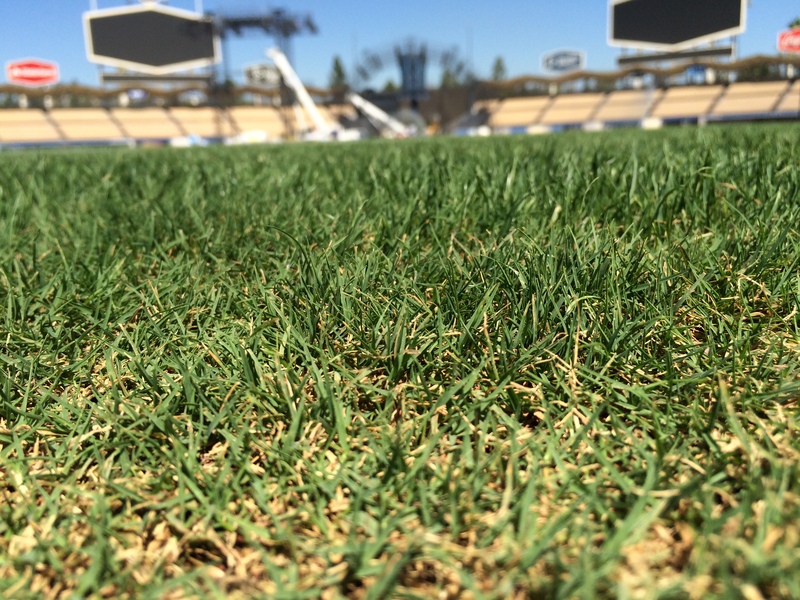 With Monday’s AC/DC concert at Dodger Stadium behind us, I went down just now to speak with Dodger groundskeeping guru Eric Hansen, who said that the Dodger Stadium field would be “more than playable” when the Dodgers return Friday for their final three regular-season home games. Tonight, I’ll sail into the waves. Blood is in the water in McCovey Cove. Madison Bumgarner is the shark. The life-raft for the Dodgers is Clayton Kershaw, with provisions of five more games after that. Sidelined since August 30 with hamstring issues, Kiké Hernandez has been activated from the disabled list by the Dodgers. Hernandez is not in tonight’s starting lineup, but seems likely to be there Tuesday when the Dodgers face Madison Bumgarner. The 24-year-old has a .350 on-base percentage and .492 slugging percentage in 201 plate appearances for Los Angeles this year. In his busiest stretch, he played 20 games (18 starts) from August 8-30 and OBPed .400 while slugging .545. While the weekend sweep at Colorado delayed all celebration in Dodgerland, it has set up Zack Greinke to kill two very large birds with one stone-cold toss.